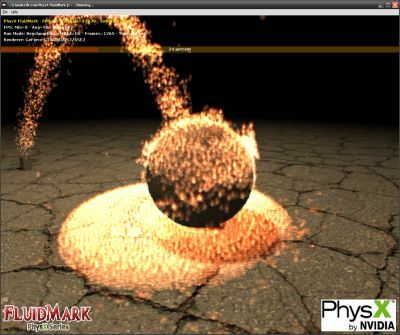 PhysX FluidMark is a physics benchmark based on NVIDIA PhysX engine. This benchmark performs a fluid simulation by imitating the renderering of lava. Real physics parameters such as viscosity are used. SPH (Smoothed Particle Hydrodynamics) algorithm is enabled to increase the realism of the simulation. PhysX fluid simulation is particularly well accelerated on GeForce hardware. 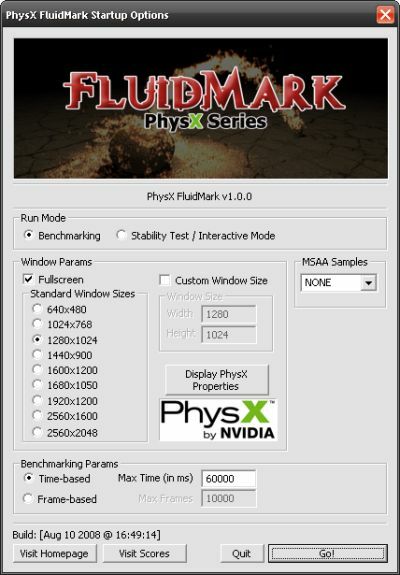 PhysX FluidMark requires the PhysX driver 8.08.01 or higher to be installed. You might need also the CUDA DLL if you don’t have a GeForce 8/9/GT200 with Forceware that support PhysX or if you don’t have a GeForce at all (Radeon users for example). Now you can select the mode you want (No Acceleration, GeForce PhysX or Ageia PhysX). Now you are ready to start the benchmark. This benchmark exploits OpenGL for graphic acceleration and requires an OpenGL 2.0 compliant graphics card: NVIDIA GeForce 5/6/7/8/9/GTX200 (and higher), AMD/ATI Radeon 9600+, 1k/2k/3k/4k (and higher) or a S3 Graphics Chrome 400 series with the latest graphics drivers. Benchmark mode or stability test / interactive mode. Interactive mode makes it possible to move the camera (mouse) and to pause PhysX engine (with P key). 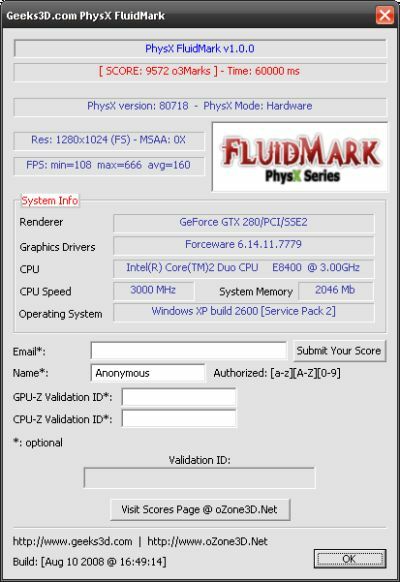 PhysX FluidMark Scores @ oZone3D.Net. The nvidia driver physx 8.08.01 force ONLY software mode in my Ageia PPU.. Instead, the nvidia physx driver 08.04.25 run well in hardware mode. Are you sure that these results are confirmed ?! i have a GTX260 videocard by nvinia (leadtel winfast series) and Vista x64 ultimate sp1, worked on asus P5B motherboard with 4Gb of memory and core2duo8500 intel processor. Forceware 178.13 (included PhysX_8.09.04_SystemSoftware.exe) has installed. But!!! FluidMark cant see hardware physx acceleration, only software mode. its killing me! palit daytona sonic GF9600GT 1024Mb has absolutely the same picture on this platform\software, so i sold it and by 260. Help me,please! what i do wrong? on russian resourses (i’m from russia) i cant find something serious information. What I would like to see is some one benchmark all the cards the can run PhysX and see how they all compare. I want to know what kind of proformance boost I’m going to get in PhysX when I upgrade from a 8800GT512 to a GTX 260.
now i know my mistake – U no need to put ANY files in a folder, that contains FluidMark. ewerything works. that it only ran in PhysX Software Mode. Catalyst is 8.12and PhysX Software is 8.10.13 with Ageia PhysX activated. Is there anything else I could have done wrong? DJ Axcess, PhysX runs in hardware mode only on NVIDIA GeForce 8+. With all other graphics cards, software mode is the only way to go! I have Mirror’s Edge, UT3, Rise of the Aguanots, Nvidia fluid demo, and alot of other stuff using a pcie x1 ageia ppu, i installed the old version of the software PhysX_8.09.04_SystemSoftware.exe , the new physx 9 driver doesnt work for anything at all, no demos, and i even tried installing the old version then the new version but that did not work, to get mirror’s edge working i copied nvcuda.dll NOT into the C:\Windows\System32 folder, but into the C:\Windows\SysWOW64 folder, thats because i use vista ultimate x64. You need to use the old drivers for now because nvidia messed it up. When i have the nvidia fluids demo (not fluidmark) running it has both options for cpu and gpu rendering, i dont have an nvidia gpu at all. ATI 3870. The fan does spin on the ppu and it runs pretty great. Mirrors edge is so much better and faster with the ageia card but nvidia wouldnt want you to know you can use their new cuda dll with a new game when their gung ho for their physx. Ill bet they only can use cuda 1.0 and not 2.0. But fluidmark runs bad comparing it to a gpu but it does accelerate it especially before their is too many particles. with both ppu and gpu cards running half the particles ill bet they would have similar fps, or not? What nobody believes me, ill answer any questions? But i would like to know how to modify the physx 9 series driver to use a ageia 100 series ppu. Does it work with the nvidia + ageia combination, or is the ppu just crippled with the 9version 9 driver? To use Ageia PPU, install PhysX 8.09.04. More information in this article. i only have some old socket639 athlon64 (but dualcore already) system, with pcie generation v.1.0 with an ati hd 4870 pcie gen.v.2.0 card and a separate ageia physx pci 128megs card. all driverse (ageia/nvidia physx 7+8+9) and ati catalyst april2009 installed. i get very low framerates even in fullscreen 1024×786. is this possible? this separate ageia card doesnt help at all it seems. and yes i have selected ageia physx enabled in the physx controlpanel element. so whats wrong here? i havent even enabled antialiasing at all. i get like score of 555 (fivehundred fifty five) in this bench. this is no close to the bench results described here (2000 (two thousand)). i think i have figured out whats wrong. i only get software physx (cpu) mode on my system. although the ageia software and drivers are all installed, and the controlpanel applet also from within the fluidmark application shows that ageia physx (i have that 128meg ppu pci card from asus) is activated. so why doesnt fluidmark use ageia physx then when its clicked and activated? 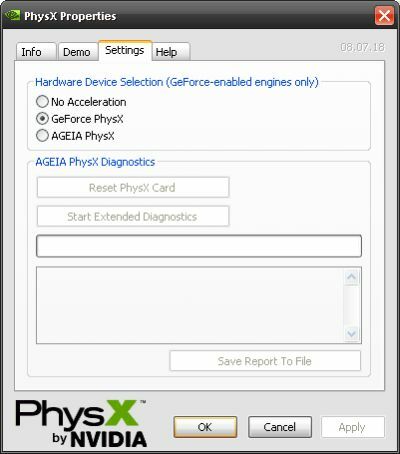 the extended diagnostics in that controlpanel physx applet checks all the register tests of the ageia physx ppu card correctly. i am new to physx. i found out that so far the “physx demonstrations” tab was always completely empty in my physx control panel window. i had to install this very special “PhysX_8.09.04_SystemSoftware.exe” from september 04, 2008 to get the fluidmark stuff work on my ageia pci ppu from asus. when using this 8.09.04 software, the demo tab in the physx control panel is also filled with some little icons where i can run some basic physx demo stuff. also fluidmark works now and displays hardware mode, and gets a score of 915 or something opposed to the 555 score when running in software mode. @DON3k > I will do some tests asap and try to clarify the situation. Thanks for the link. Core 2 duo E7200,runs greatly at 3ghz,4gb ddr2 1066,and a stunning…..
got the icons in the tab,got a sistem tray icon down showing acceleration and stuff…even the fps is high :-O 60+ so i warmly recomend the soft version! im using Windows Vista 32bit O.S,sis spec same hd4670 2x…..